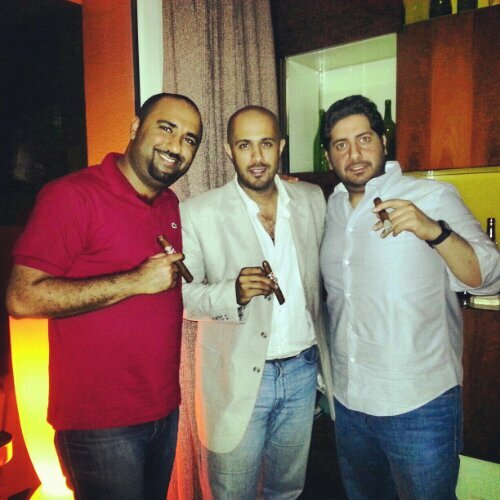 Finally the GCC “Gulf Cooperation Council” bloggers herf was held, it was in “the city of life” Dubai. The GCC bloggers known to date are 3 including me. The other 2 are Mr. Munther of perfectsmoke.org and Mr. Abdul Raheem of memycigar.com, if there’s a hidden one please show your self. We were joined buy a couple of nice guys who were Newbies to the Cigars. This herf was delayed so many times for so many reasons, but yeah at last we made it. I can’t describe how happy I feel about the experience of herf-ing with those guys who shared the same passion and appreciation to the fine smoke. It all started late afternoon at La Casa Del Habano JBR, and since the weather was ideal we decided to light up outdoor, and for the first time I went to LCDH and I didn’t enter the walk-in humidor!!!! That because I was overwhelmed my a generosity of those gents. And after few hours Mr. Raheem suggested another place which was very nice and cigar friendly plus an amazing live Jazz. At Oeno wine bar we had more in-depth cigar talks and let me tell you my buddies knows a lot about what they’re smoking. This herf allowed me to learn more about cigars to be honest, plenty of useful, funny and strange info that I never heard or read before. At the end I would like to thank Munther, Raheem and the other Gents for making it this herf Count, I hope to make it again and sooner then expected. Thx for this nice report… what´s the meaning of “GCC”, Ahmed? good company, fine cigars and a great location – i’m very jealous ! A hidden one, eh? :) Next time, i’ll hopefully be there.